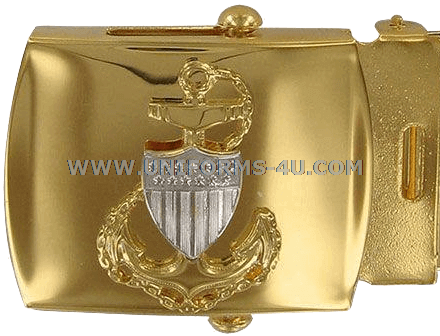 This tasteful ornamental buckle is compatible with the Coast Guard’s standard web belt and is mounted with the shield-and-anchor associated with Chief Petty Officers (CPOs) in the Coast Guard and its precursor services for over 100 years. 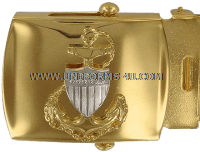 Though not explicitly authorized for wear (nor explicitly prohibited) by the current Coast Guard Uniform Regulations, it recalls that era during the 1970s and early 1980s when buckles adorned with rate insignia and other graphics were permitted for wear with everyday working uniforms (all Guardsmen were still required to have at least one plain brass buckle for wear during uniform inspections and if prescribed by a Commander). The fouled anchor with a superimposed shield on its shank dates back to the Revenue Cutter Service, where it served as the emblem for the service’s Officers. And the shield’s lineage extends to the end of the 18th century, when Congress added it to the ensign flown by Revenue Cutters to distinguish them from other naval vessels.